“Curved Sirio” model is suitable for cafe- shops furnishing; it permits to take advantage of display surfaces, using corners of counters. 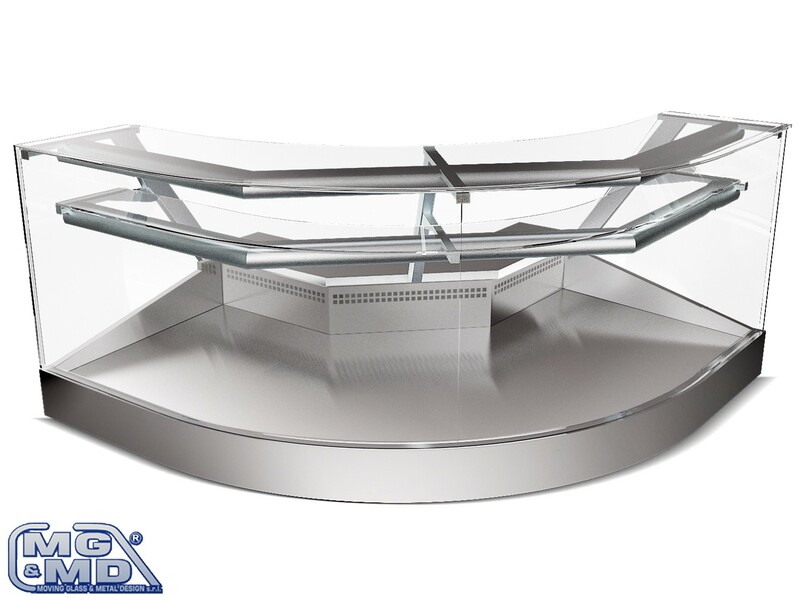 The basin is monobody insulated by low-density ecological polyurethane. Inside in aisi 304 stainless steel, outside in plasticized plate. Automatic defrosting by electrical resistances. Stainless steel shaped display trays on the basin bottom. Controlling by electronic control unit integrated in the back. glass frame structures in silver anodised aluminium as standard (gold on request) with top neon light and intermediate shelf with neon light (as expected); basin lined up end sides and shaped fixed back doors in plexiglass (not sliding). In addition to corners with plan sizes 1300*1300mm and 1500*1500mm it’s possible to realize linear parties with “sirio small static” model with the same section, in order to obtain display cases of any length. 2° intermediate shelf without neon light. 2° intermediate shelf with neon light (the first shelf is standard). Stainless steel at sight for front and bottom surfaces. Built-in motor connected below the basin.